It’s been over 90 years since Jaguar was created, initially as the Swallow Sidecar Company in 1922. 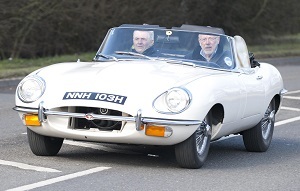 It was a further 13 years until the brand created its first sports car, and Phil Weeden got a chance recently to try three different decades’ of Jaguar sports car – SS100, XK150 and E-type. We start with the original – the SS100. Well, it’s not quite the first as the SS90 preceded it by about six months. But it was the SS100, unveiled in September 1935 that really grabbed the headlines. Initially using a 2.5-litre straight six Standard engine, it’s dubbed ‘100’ due to a hypothetical 100mph top speed. There’s no doubting the SS100’s pedigree. The 102bhp 2.5-litre example that we’re in makes a truly wonderful noise; that glorious engine thunders away up front beneath the long sculpted nose, the large chrome headlights perfectly frame the tall distinctive grille. And like all Jaguars that followed, it has a tremendous sense of proportion. Looking good from any angle, it possessed the sort of grace normally reserved for far more expensive cars, such as Bentleys and Aston Martins. The bigger-engined 3.5-litre version, with 125bhp, cost just £445, when a similar BMW 328 was £695 – that’s the equivalent of £23,820 and £37,203 respectively in today’s money. The ride is firm, but there’s elegance and poise with the way the SS100 handles, the sense of occasion heightened by the large steering wheel and evocative dials placed in the simple fascia. For all its sporting prowess, the SS100 was merely a shop window for what Jaguar was capable of, giving it an allure the brand had previously not possessed. Just 118 3.5-litre and 190 2.5-litre SS100s were made between 1937 and 1939, compared with over 8000 similarly engined Jaguar saloons. Jaguar had been busy during the war years, developing its own engine. Dubbed the ‘XK’ it was a 160bhp 3.4-litre straight six, DOHC engine. While it was intended to be installed first in the MkVII saloon in 1950, a concept car was used in 1948 to publicise the new engine. The XK120 was born, but such was the response to this curvaceous new sports car concept that Jaguar was compelled to put it into production. It was made of aluminium for the first two years; steel-bodied thereafter. Come October 1954 the 120 was replaced by the 140, with more chrome, more comfort, and power now up to 190bhp. The world was hungry for the XK, especially the American market. In May 1957, the XK150 was introduced – slightly larger and more comfortable than its predecessors. It was clearly aimed at meeting the demands of buyers from across the Atlantic. Compared with the SS100, it’s considerably more expensive, up to £2110, or £40,068 in today’s money, although still roughly in line with the price of an average property, which, in 1958 (the year our test example was built) was £2300. Performance is on a par with the SS100, but response is more instant and power delivery is smoother. 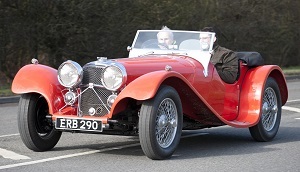 The figures paint a more emphatic picture than is ultimately felt from the front seat; the XK150 accelerates to 60mph in 8.0 seconds, almost three seconds quicker than the SS100. It would be capable of going onto a 129mph top speed, whereas the SS100 would only just break the 100mph barrier. The E-type’s Malcolm Sayer-penned shape perfectly captured the mood of the Sixties. While beneath the bulbous bonnet, the XK engine was effectively the same 3781cc ‘S’ spec engine that had appeared in late XK150s, powered via the same four-speed Moss gearbox, there was new independent rear suspension (IRS). The Series 2 was introduced in October 1968 comprising styling tweaks in order that the car met US crash regulations. Aside from that, there was little difference from the ‘Series 1 ½’ it replaced. It lacks the purity of the earlier versions with the larger indicator units now situated below the higher bumper line, which dissects the oval grille, thus spoiling that curvaceous face. The 4.2-litre straight six, kitted with triple SU carburettors, could propel the E-type to 60mph in just 7.2 seconds, and on to a top speed of 142mph. 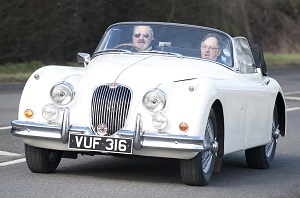 Those improvements over the XK150’s performance are also noticeable on the road, and it feels more lithe. The steering feels sharper and more precise, the suspension still has compliance but now boasts more agility, helped no doubt by that sophisticated IRS. This example was built in the peak year of E-type production; in 1969 almost 10,000 of these iconic Jaguar sports cars rolled off the production line at Browns Lane in Coventry. Over 8500 of them were exported. It was tremendous value, costing around £3000 at the time, or around £41,000 in today’s money.